It's a mysterious book that in its day was believed to contain all human knowledge. But why did medieval people believe that the author sold his soul to the devil to be able to write it? 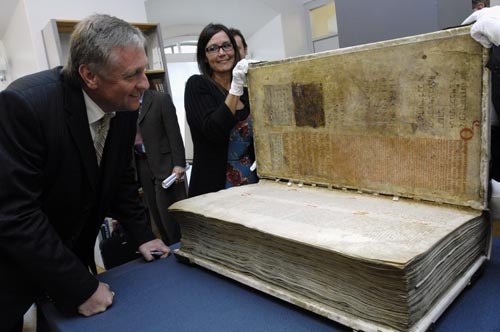 The "Devil's Bible," a behemoth volume weighing in at 165 pounds, believed to have been produced by a single monk over the course of decades in the 13th Century, is the focus of a documentary that was featured on the National Geographic Channel. A complete Old Testament and New Testament, and a collection of a number of secular works besides, the Devil's Bible is an encyclopedia of medieval knowledge. But it has also been haunted by dark speculation, including that its writing was guided by the devil's hand. 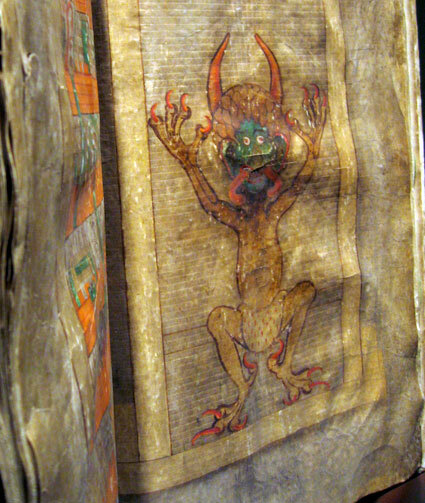 It got its name "Devil's Bible" from the illustration of the devil on page 290 (in the photo above). 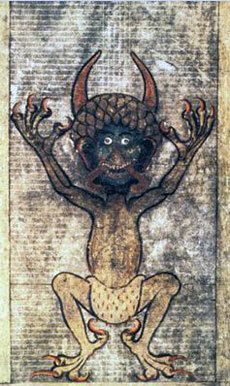 It is believed to be the only bible of its era that depicts Satan. There the devil is, looking more like a cartoon character in an ermine diaper, rather than evil incarnate. What makes the Devil's Bible such an object of fascination is the back story associated with it. According to the TV show, which I watched when it premiered, the legend about the Devil's Bible was that it was written by a monk in a single night. The story goes that such a feat was possible only because the monk had made a compact with the devil. The implication is that the devil himself wrote this bible, which is why his portrait adorns it. 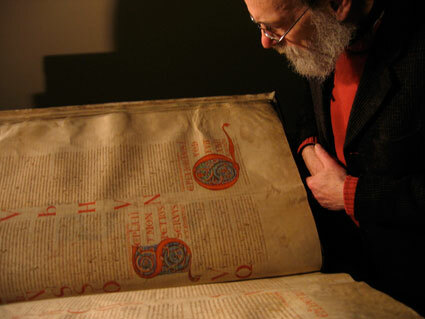 The television show combined the story and the extraordinary history of this giant book with modern forensic science to see what can be established about the Devil's Bible. 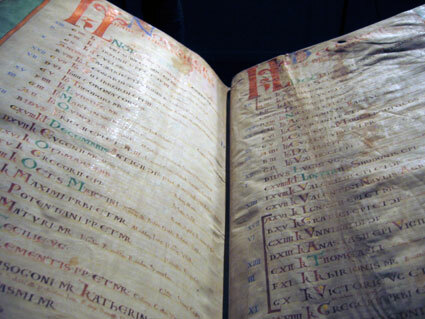 The manuscript was definitely produced by one person, according to analysis of the ink and penmanship. Most likely the producer of the Devil's Bible was a monk whose name is mentioned in the index and who probably devoted many, many years to the task, perhaps as a form of penance. 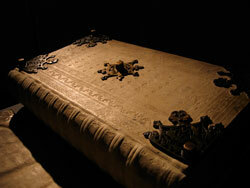 The Devil's Bible was written by one person, but it was not written in a single night. The provenance of this extraordinary book and its unlikely story as well as its journey across centuries, passing through a succession of monasteries and royal palaces to its current destination, the National Library of Sweden, is a legitimate story for National Geographic to cover. And it makes good television too. Also included in the Devil's Bible, on pages that follow the picture of the devil, (the picture below), are detailed instructions for the exorcism of demons or evil from people and objects. There are also two magic spells, both with specific instructions on how to identify and catch a thief. Possession by demons was commonly thought during medieval times to be the cause of many illnesses. The church had specific rituals to exorcise evil by casting demons out of an afflicted person's body. According to the Christian New Testament, Jesus gave his disciples the power to cast out evil spirits, which is why scholars believe the medieval exorcists commanded demons to leave an afflicted person's body "in the name of Jesus Christ." The incantations for exorcism would not be out of place in the Devil's Bible, appearing after this picture of the devil. · The 310 parchment leaves (620 pages) of the Devil's Bible are made of vellum, from the processed skins of 160 animals, most probably donkeys. Some pages of the Devil's Bible are thought to have been removed, and no one knows what happened to them. · The entire Devil's Bible is written in Latin. The calligraphy is lavishly luminated throughout. 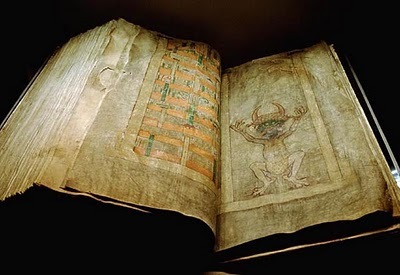 · Including its wooden case, which is ornamented with metal, the Devil's Bible is so heavy (about 165 pounds) that it requires at least two adults to carry it. · The portrait of the devil faces a picture of the "City of Heaven," the only other image in the Devil's Bible. Some scholars believe that the picture of Heaven negates the portrait of the devil. Others have noted that no people can be seen in the City of Heaven. Also inthe Devil's Biel is the "Encyclopedia" by St. Isidore, whoh, more than a millennium after he lived, is regarded as the patron saint of the internet. Isidore's Etymologiae was an attempt to record all universal knowledge of his time, the 7th Century.